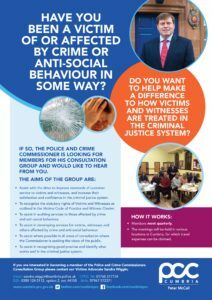 Have you been a victim of or affected by crime or anti-social behaviour in some way? Do you want to help make a difference to how victims are treated in the Criminal Justice System? If so, the Police and Crime Commissioner is looking for members of his Consultation Group and would like to hear from you! • Assist with the drive to improve standards of customer service to victims and witnesses, and increase their satisfaction and confidence in the criminal justice system. • To recognise the statutory rights of victims and witnesses as outlined in the Victims Code of Practice and Witness Charter. • To assist in auditing services to those affected by Crime and Antisocial Behaviour. • To assist in developing services for victims, witnesses and others affected by crime and anti-social behaviour. • To assist where possible in all areas of consultation where the Commissioner is seeking public consultation. • Members Meet quarterly and report in to the Safer Cumbria Victims and Witnesses Group and to the Office of the Police & Crime Commissioner summarising progress to date, work in progress, and clearly identifying process issues which require Action Group resolution. • Expenses can be refunded in respect of travel costs to and from the quarterly meetings which take place at Police HQ, Penrith.